It’s amazing to see the growth but I am concerned member numbers could get too long. Perhaps we should consider going to alphabetical prefixes to prevent going into 6 digit member numbers. ---General Robert E. Lee, C.S.A. I like the Hexadecimal idea. It is better than using binary or decimal numbers and should only confuse about half of the members. The only issue is the “C” level operators would have to be a slant C but that is easy. Dave, that's a fine idea. Let's push forward with it. We could have octal, decimal, duodecimal or hexadecimal. With hex most of us could save a digit right now. Why we could even honour our Sumerian predecessors with base 60; it works for angles and time, after all! From now on each S.K.C.C. number if not hex must be followed by the operator's radix of choice! Ho! John at radio station VE7AOV S.K.C.C. 32BC. For those who struggle with digits any higher than 7, then 31274 octal! Oh, yeah; for those of you who hold Demercado's Canadian digital ticket: 11001010111100. Hexadecimal doesn't do me a bit of good. 9104 = 2390 (hex) and each has 14 dahs and 6 dits! Base 32, on the other hand, gives me 8SG. With hex, "T" and "S" are ok as they're not used in hex numbers, but "C" Centurion would have to be changed - maybe to "N" or "U"? Given that most of us do not know 60 morse characters, base 36 (letters+numbers) would be the largest we can manage. We could put the CTS after a slash. However, my number is still sent faster in base 10, so I vote for no change. You folks must be celebrating Mardi Gras early to come up with this thread. No one mentioned Roman numerals yet? What can we all say about it but that your S.K.C.C. number is truly.../classic/! I have not thought about the alphabet! I have recently put up a new antenna - a 270 ft OCF (8 Band). On 160,80 and 40 I have lots of RFI - my computer goes nuts. All equipment in the shack (radio, tuner and power supply) are all grounded to an earth ground. I have tried an ugly balun - no joy, I have tried an MFJ current filter no joy. I was thinking I should put snap on ferrites on all my computer wires but can't seem to find a part number for anything that offers any real impedance in the 1.8 to 7 meg range. So any suggestions on how to tame the new antenna? When I was running a full size G5RV 80 meters would occasionally act up. Wireless mouse and keyboard helps. 40m, 17m and 20m still affect my cry and computer. Did not have an effect on my old laptop. I also have these connectors between my antenna coax and AT2K tuner. They go to earth ground also. My radio and tuner do not seem to be affected by rf. Tom, there are 2 separate issues you need to consider. First is RFI arriving from the antenna radiation. If that's the case, you will needto move the antenna or reduce power or shield your equipment. The second is common mode current, an OCF antenna is not balancved so the probability for common mode current is high. If that's the case, you need to in stall a 1:1 balun on your feedline, you can easily make one from some coax rolled up in a coil. GOOD LUCK, rfi PROBLEMS CAN BE FRUSTRATING TO TRACK DOWN. i became an expert when I wwas operating from the 10th apartment with a indoor vertical 10 ft from my rig! I have used a 1:1 balun or a line isolater on my MFJ 80 - 160 OFC dipole It to is 270 feet long and also does work very well on 40. Do you have a ground rod and all equipment on the ground line. I had a similar issue with a G5RV that was 100ft from my house. I could not use it on a couple bands because it would shut off TVs, restart computers, etc. I found that the way I had my coax routed caused the problem. It ran along the top of the outside wall under the eaves. I took it down and ran it along the ground to test it and the RFI was almost gone. I am sure the coax was radiating because I did not have any type of common mode choke in the feed line. I tried an ugly balun and it made no difference. I bought a feedline isolation balun from Balun Designs (Model 1116di) and it completely eliminated the issue. I could then use the G5RV on 80-6m with no RFI problems at all. Note - I am in no way affiliated with Balun Designs. I just like his stuff. In addition to snap-on ferrites consider winding power cords etc through torroid ferrites. I have found that re-arranging equipment in the shack can help. Even though my K3 will match my endfed wire antenna I use a manual tuner instead, located on the other side of the desk from my computer equipment. Also consider wireless mouse and/or keyboard. The fewer cables lying around, the better. All of this is a bit hit-or-miss. It will help if you have some kind of rf sniffer. A microammeter with a germanium diode across the terminals will work. I have used this to sense rf levels near keyboard, monitor, etc. A snap-on RF ammeter can also be made with a few simple parts; I currently use one as an antenna current meter on my endfed wire, but it can also be set to sense much smaller currents on computer cables, power cords, etc. An earth ground is not necessarily an rf ground. I have one on my EFW tuner to try and steer the rf away from computer equipment. AS DAVE SUGGESTS THE FEEDLINE ROUTING MAY BE THE CULPRIT. CAN YOU RUN THE FEEDLINE THE GROUND OR UNDERGROUND FOR A BIT. EVEN IF YOU NEED TO ADD SOME EXTRA CABLE IT MAY BE WORTH IT. I HAD ONE OCF THAT NEEDED ABOUT 30 FEET OF THE LINE LAYING ON THE GROUND FOR IT TO BEHAVE. IF BY CHANCE THAT EXTRA LINE CREATES TOO MUCH, COIL IT UP AT THE POINT WHERE IT GOES UNDERGROUND OR ON THE GROUND. IT ALSO HELPED THE TUNING ON 80M GREATLY. DONT ROUTE THE FEEDLINE NEAR ANYTHING METAL. My suggestion is to go to a 160M Dipole fed with 450 Ohm Twinlead.Or 450 Ohm Twinlead to a Balun then RG-213 or? An OCF is by nature unbalanced. This may result in RF current flowing on the outside of the coax shield when you transmit. Sounds like what you might be experiencing. I would suggest putting an RF choke in line on both ends of the coax feed line. Start with at least one at the antenna end. This will force balance between the coax center conductor and shield minimizing or eliminating the RF current otherwise flowing on the outside of the shield. Take a look at Palomar Engineers super choker product. 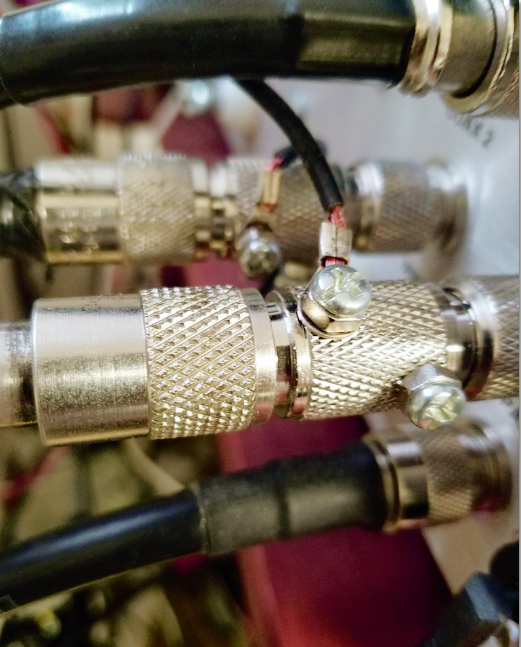 You can either purchase the cores ( 31 mix) and duplicate the choke on your coax or purchase that product and install it in line. To minimize the number of costly ferrites you install in your shack, purchase an RF current meter (MFJ-854). Transmit at full power with the meter clamped around each wire on an individual basis. Where you see current flowing, apply a mix 31 clamp on and increase the turns of wire through the clamp on until you see little or no current flow. I think my worst case rf current flow on any given wire in my shack is around 7 mA. Plenty to learn in that area. If there were any question about the need for ferrite on your antenna, you can use the meter to measure that as well. Tom, Ground the computer case to the rig, pwr supply and the tuner. If that does not work you need to add ferrites to all wires going into the computer, including the ac computer line. Check the conductivity between your ground rod and the earth. I once had a ground rod that corroded and had a very high resistance contact with the earth. Salt water helped temporarily until I installed a new longer ground rod. Too bad you did not research the OCF that has a reputation for feedline radiation . Hey Tom, it just occurred to me that Balun Designs has a special balun/common mode choke device made specifically for OCF dipoles. This is an interesting thread but there is a point to be remembered; if there is RFI in the shack that is not a grounding issue then you may well have RF energy being radiated in your shack. While RF energy is not as damaging as ionizing radiation there is ample evidence that it is not all that good for the human body. The higher the power the more risk one assumes. So if the problem is RF being spilled into the shack from feed lines, poor connections or whatever reason, it behooves us to find and eliminate the cause, not just for the electronics but for ourselves. One other possible source I ran into once, the power lead into my house was in close proximity to a leaky coax. The power lead acted like an antenna and it got into every electrical device in the house including the alarm system. In that case, replacing and rerouting the coax fixed the issue. A ground rod is not always an RF ground; depends on the length of wire between it and rig. If the length is 1/4 wavelength on some band it will have a high impedance (at the rig) and will not be an RF ground on that band. 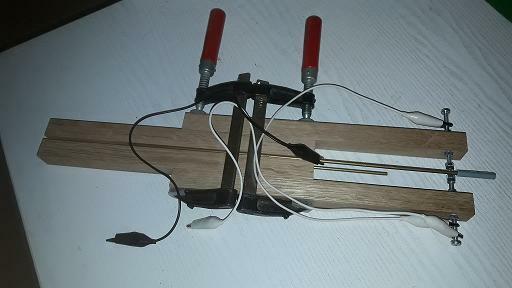 Detach the same wire from the ground rod and it becomes a counterpoise with a low impedance at the rig. I eliminated the RF feedback on my 260 feet doublet using 2 methods. I made a ugly choke balun (photo attached) and also wound 8 turns of RG8 coax around a 2 liter soda bottle, taped the turns together every few inches, and then threw the soda bottle away. I just let it lie in the shack floor near the window my coax comes through, I was still getting a little RF into my amplified PC speakers and a few snap on ferrite beads took care of that. Have you tried going QRP? I made the trip to the "other" side back in the late 80s after my neighbor said I burned out her iron with my ham radio transmissions. and I have never had so much fun with ham radio since. I do not have RF in the shack anymore. Stereo speakers or TVs show no problems. I don't have to worry about buying amps and other high priced ham gear. Rigs are smaller, easier to build, and most are CW (yeah)! Sold the amp after not using it for 10 years. I have many friends who have gone this way and they agree it is really as much fun or more. 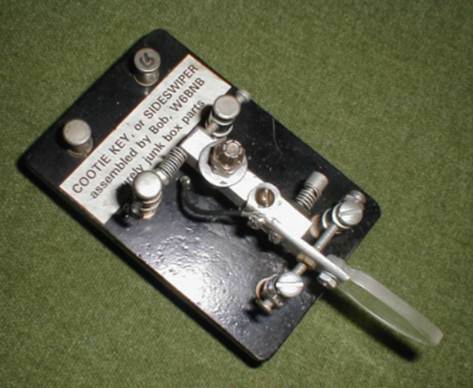 Try turning the power knob all the way to the left and be amazed you can still make contacts and it brings a smile to your face when you work Lower Slobovia (GH0ST) using 5 watts and a wire antenna. This weekend, as an example, I worked 20 different countries on 80M CW(QRP/4.9 watts) during the ARRL DX test. Worked one new one for a total of 66 on 80M(QRP). Shooting for 100 and DXCC. Still HTMF after 60 years a ham (next month I'll turn 76). And yes, I've gotten excited again about SKCC and with Ron's software, I've applied for a whole bunch of SKCC achievement awards. See you in the sked room. Would like to work you 2xQRP. FYI, a real highlight .. yesterday VK4TJ (#4474) answered my CQ on 30M. QRP (4 watts) of course and he said it was long path between us. It was a pleasure to get a contact with you yesterday. Even it was difficult, that was an exciting QSO as I like them. Many thanks for the 439 report you sent me. Please tell me if you were operating QRP for this contact ? Here I used a FT-840 with about 30 watts output into an old Hy-Gain DX88 multiband ground plane. Its works well on all bands but 30 m not good and a high SWR on this band unfortunately. Generaly I am QRV for quite every SKS-E and WES SKCC acivities for a few contacts. Good bye OM and I hope to meet you again soon for another SKCC exchange. Best 73 es take care my friend. I will probably go with a super choker from Palomar. The antenna came with a Unidilla balun. Just for info, the ground rod I am using is brand new sunk in 8 ft of moist clay. Hopefully within a week or so this problem will be history. Like I have posted in our Facebook page, the CWops organization is looking for nominations for awards. I believe that the SKCC Group has done an outstanding contribution towards meeting the purpose of the award and will continue to do so. Details and instructions are in the link attached. Oh, could I nominate myself? Photos show contacts attached on both sides of the main lever. The lever appears to be adjustable forward and backwards to change spring tension but if so, how can the contacts remain aligned? I would love to own a Bunnell someday but until then I must rely on photos and others for understanding. Now I see that the block is 2 parts and slides instead of the lever. Actually the blade won't move. A small block of brass is sliding along the blade in a sliding channel, increasing or decreasing the flexible portion of the blade. The brass block is secured by a thumbscrew. Some keymaker needs to duplicate this key. Unfortunately, I tried to do this once, but I got threatened by the current owners of Bunnell with a law suit. Can they sue for an expired patent like that? I don't think so, but if they have done their homework they might have registered "double speed key" as a trademark. I think the owners are both NYC attorneys, so they have the skills to make you waste time in courts even if you win. You could write them to license the design, maybe they'd go for that. You would want to consult an attorney though as they could and would take your license agreement as proof they have somethingvto license. I have a name for these type people but I will not say it here. Boy....if you call that still being in business. I've been toying with making a version of the Dyna Maniflex as many have before me, but I'm wondering if the tension adjust by sliding the post that the lever rests on is any better than using a magnet system to adjust tension. Didn't someone develop a uniform tension by repelling magnets? I ran across that somewhere. I think having a greater tension at the point of contact is a bad idea as it leads to problems with good contact being made on the contact points. But if you could do what keyboard keys do, build up the pressure and right before contact go to very low pressure, you'd have excellent pressure. On another subject Mr. Begali is still working on the two lever Russian type bug. He is a perfectionist. Personally I don't like springs or magnets. Magnets cause the lever to continue bouncing around and opposing springs are just plain weird. My hacksaw blade has the best feel of any cootie I've tried. Being able to adjust the tension with the Manaflex slider gizmo makes a lot of sense. Even so, I would love to try a real Bunnell just to see how it feels. The feature I like on the Bunnell double speed is the tactile response of actual hard contacts along with the adjustable tension block on the main spring. To me it seems to have everything. The DSK is to stiff in my opinion. Having two unmovable contact points on a ridgid unbending material is a plus. My Vibroplex single lever does this quite well and in my opinion is a better key. My Kungsimport sawblade sideswiper with the tiny wooden finger piece - very small mass - is the best, the key bends when it contacts the contact post and it is very fast because it is very low mass. 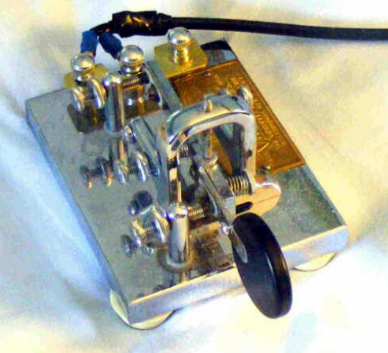 Our founder, Bob Schrader, W6BNB made a key very similar to my Vibroplex single lever out of old telephone relay parts. It was his favorite key, his son, now W6BNB gave me that key and it has a lovely feel, much lighter than my Vibroplex single lever but not as light as the Kungsimport key. It makes a solid contact. It's not much to look at but it's a very nice key to use. 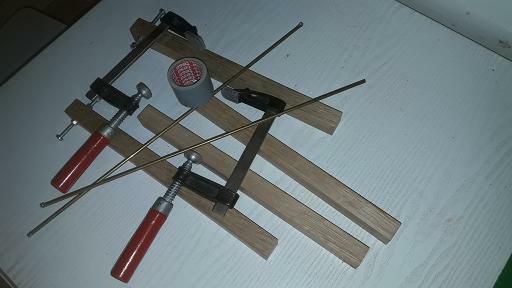 Finally found a piece of wood at Hobby Lobby and stained and varnished it and rebuilt the home brew key. It looks better than the scrap wood it was on. Using a cootie about 95% of the time now. 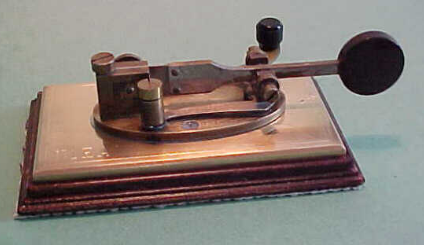 If you are in need of a morse key and you do not have one at hand, you could perhaps try this one. And if you are in a hurry you could assemble it in less than 5 minutes. some nuts and bolts for the contactpoints. some sticky tape to form some sort of finger pad. See attached 4 pictures and 1 mp4 file with some cw on it. It isn't a Bunnell but you can make the thing sing ! Sorry for not getting back sooner to you dear Paul. First, the "HAH, Half An Hour" cootie, now the "5 minutes" version, next step... The "50 seconds" cootie. I know it's a cinch for you, no challenge stand in your way. An on air demo would be greatly appreciated, so BCNU SN cher ami Paul. 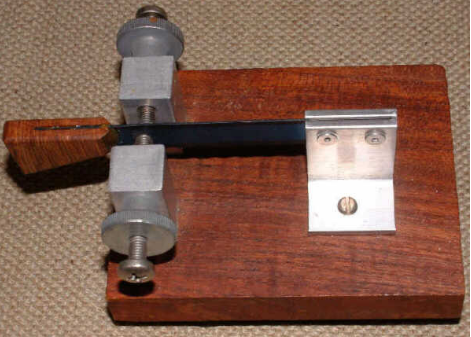 If you are in need of a morse key and you do not have one at hand you could perhaps try this one. And if you are in a hurry you could assemble it in less than "50 seconds"? A steak is taken raw or medium. Insert two forks into the steak in an A form. Connect these to each other with an electric wire with -alligator clips also called mother-in-law beaks- at one of the key input. Take a steakknife, connect the metal of the knife with a wire to the other key input. Move the knife on the SSK way between the forks. Low for a wide sweep, high for ......... clear anyway. This is seconds work, unless there is no steak present and the animal still needs to be slaughtered. Sri no photo available, something or someone has eaten it.